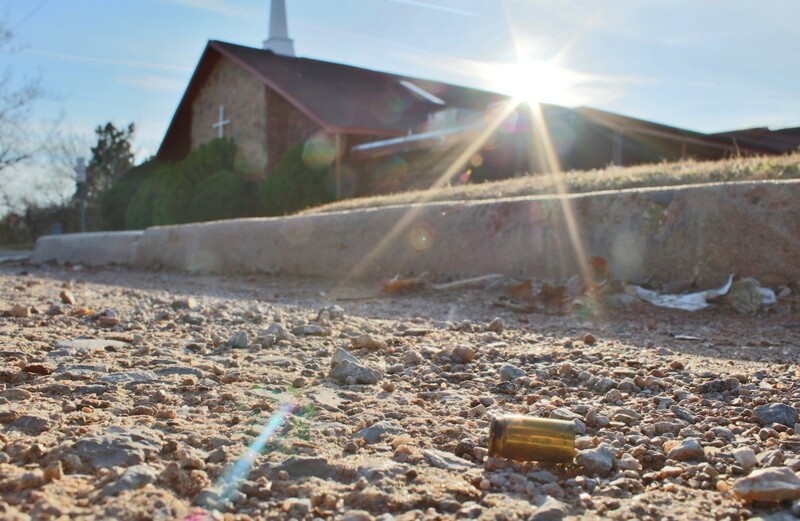 A bullet shell lies near a church in northeast Oklahoma City. This photo was taken as part of the mobile video project, "Talk With Us: Poverty in Oklahoma City Neighborhoods." TULSA – Oklahoma Watch and the University of Oklahoma’s Gaylord College of Journalism and Mass Communication won first place in the Great Plains Journalism Awards for a mobile video project focused on low-income neighborhoods in Oklahoma City. Oklahoma Watch staff members also were finalists in the eight-state competition for in-depth coverage of mental health, disparities in discipline of special-education students in public schools and the impact of business tax breaks and incentives. The mobile video project, called “Talk with Us: Poverty in Oklahoma City Neighborhoods,” won in the category of multimedia project or series and involved reporters from Oklahoma Watch, students from the Gaylord College and students from Santa Fe South High School and Harding Charter Preparatory High School in Oklahoma City. Oklahoma Watch journalists and students went into low-income areas in northeast, south and west Oklahoma City to record short video interviews with residents about problems in their neighborhoods and lives. The reporters then showed those videos to government officials or community leaders who might deal with the issues, recorded their responses and placed the pairs of videos online, accompanied by data, facts and interactive graphics. The goal was to create a virtual conversation between decision makers and people who often have no voice. “Talk With Us” was one of 12 journalism projects nationwide funded by grants from the Online News Association Challenge Fund for Innovation in Journalism Education. —“The Punishment Gap: Disparities in School Discipline:” a series by Nate Robson. Finalist, project/investigative reporting. —“Business Breaks:” a series by Warren Veith and Mark Lash. Finalist, business reporting. The annual regional competition, sponsored by the Tulsa Press Club, features awards for the best journalism in print, web, television and magazines in Oklahoma, Arkansas, Iowa, Kansas, Nebraska, South Dakota, North Dakota and Missouri.